While there’s a wide array of fashion, beauty and style advice aimed at older women, for older men the advice is less prevalent, but perhaps no less needed. In fact, older men may suffer from ageism as much as older women and one commentator has even predicted that in the next recession, older men will be out there pursuing their botox and hair dye products as much as any woman would, given the competition for jobs from younger people in the workforce. For men, the societal transition from formal workwear, such as suits and sports coats, to more casual attire has also created some clothing landmines, especially as men get older and risk ridicule by looking either like “they’ve given up or..don’t know when to give it up,” as fashion commentator Adrian Clark recently opined in The Guardian. Clark advises that less is more for older men- so if you’re a guy over 50, he recommends you shed the cargo pants, lose the zippers and find a good tailor to create comfortable but streamlined clothing. Over at GQ magazine, you’ll find a guide, and good male role models, for dressing at any age, including your 50s, 60s and beyond. And even AARP has gotten into fashion advice, with their guide to men’s jeans after age 50 (you clearly want to avoid the “Dad” jean look!). Finally, for a bit of fun (perhaps at your own expense), take a look at this recent video from celebrity menswear stylist Ashley Weston, whose clients include celebrities Chadwick Boseman, Darren Criss, and Paul Dano. 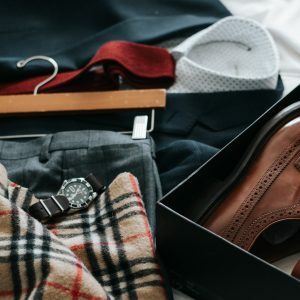 While you may not come out looking like George Clooney, her advice for styles to avoid for men over 50 should at least allow you to maintain some dignity as you try to navigate today’s fashion rules for older men.